The Spence family is an integral part of the past and ongoing operation of our firm. Spence Brothers have an incredible dimension that encompasses heritage, values, and integrity that was ignited by our founders in 1893 – and has been supported passionately throughout four generations of family leadership. Maintaining our values as an organization is key. Today, Spence family leaders and key extended family members continue to lead our company with an extreme focus on customer service and relationship building. We not only want the opportunity to build your next construction project, we look to build our next trusted relationship. Our history of successful projects and tenacity as a company has afforded us great financial stability. Along with this stability comes measurable financial strength. Our construction bonding capacity for major projects is $300 Million annually – with an individual project maximum of $100 Million. Surety Bonding is a performance insurance measure ensuring the Owner of a satisfactory completed project. Not all construction firms can offer this level of bonding protection. In fact, some are not able to provide any bonding whatsoever. Higher-level bonding capacity is offered to those construction firms with an exemplary record of completing projects consistently on time, on or under budget, and with no history of complications. The truth is, Spence Brothers is recognized and rewarded with our bonding capacity due to our flawless construction record – and we’re pretty proud of this. 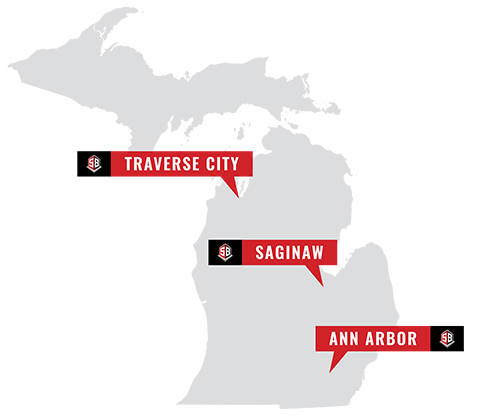 Spence Brothers has three strategically placed office locations in Michigan. Our Saginaw, Ann Arbor and Traverse City regional offices provide flexibility and manpower to effectively manage construction regardless of location. Our geographical presence allows us to match our construction personnel to your project not only by their expertise, but by their proximity – it’s important for your project team members to be close and accessible throughout construction. Let’s be real. It all comes down to getting the best quality work for the lowest possible cost on bid day. Our subcontractor relationships are strong and widespread due to our construction presence throughout Michigan. Subcontractors love to work on Spence Brothers projects because they know our jobs run smoothly, are well-managed and are time-consciously delivered. We keep our subcontractors happy by getting them into the site on schedule, allow them to get their portion of the work done without delays, and pay them quickly upon successful completion of their scope of work. How we treat our subcontractor relationships results in lower bids to Spence Brothers on bid day. It will save you money and expand the impact of your construction dollar.